Well I have finally finished my first set of swatches (5 in all) for lesson 1 of the TKGA Basics course. I am enjoying it immensely. 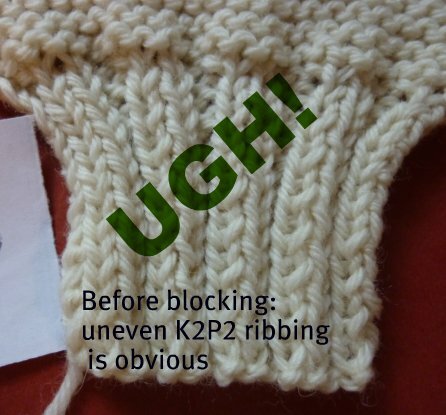 Primarily because for the first time in my life I am actually granting myself the luxury of thinking about my knitting, analyzing my knitting, researching, rethinking,re-doing, and finally appreciating unreservedly what can be done with two sticks and string. I am learning how to actually make increases lean left or right at my will. I'm learning how to make them invisible. I am using duplicate stitch to weave in my ends. All of this is new to me. I'm trying out new techniques and comparing them with my old standbys. I am humbly learning that some of my old standbys are sadly lacking. Case in point: Being the lazy so and so that I am (fully admitted) I taught myself to knit right wise and left wise so I wouldn't have to purl. "I hate purling" I announced. In Swatch 2 of my swatches, I did the requested stocking stitch dutifully turning my work knitting one direction and purling back on the next. By the time I hit Swatch 3, I declared "I don't like this - and I'm returning to my lazy ways" and I knit back and forth. I was quite anxious by this, and wrote to my instructor asking for "permission". The response was a common sense one telling me it was not the intent to tell my how to execute the required task at hand - but that the tension must be even, the stitches not twisted, and the increases were to slant in the correct direction indicated in the instructions. Relieved, I carried on my merry way. Today I blocked the swatches... and look what I discovered. A : Swatch 2 (back) - stitches look even. B: Swatch 3 (back) - uneven stockinette stitches with gutters. C: Swatch 4 (back) more gutters! Needless to say Swatch 3 &4 are now in the do-over pile. Remember this Swatch - with the awful looking ribbing? I found a little video on YouTube a few years back when I was looking to block a fairisle afghan that I had knit for the Ravelry 2010 Winter Ravelmpics. The author is Annie Modesitt. She had me so sold on the Scunci Steamer, that I found one on Kijiji and was rearing to go. Well, time to revisit Swatches 3 and 4 -Swatch on!